We're in love with these pretty semi-naked wedding cakes that are the perfect combo of rustic and effortlessly chic minimal icing. Top it with fresh flowers and you have a lovely combo that's pretty and edible! Naked wedding cakes are still very much on trend, however, the added touch of icing to sure to appease traditional desert lovers! You don't need to deal with fondant! 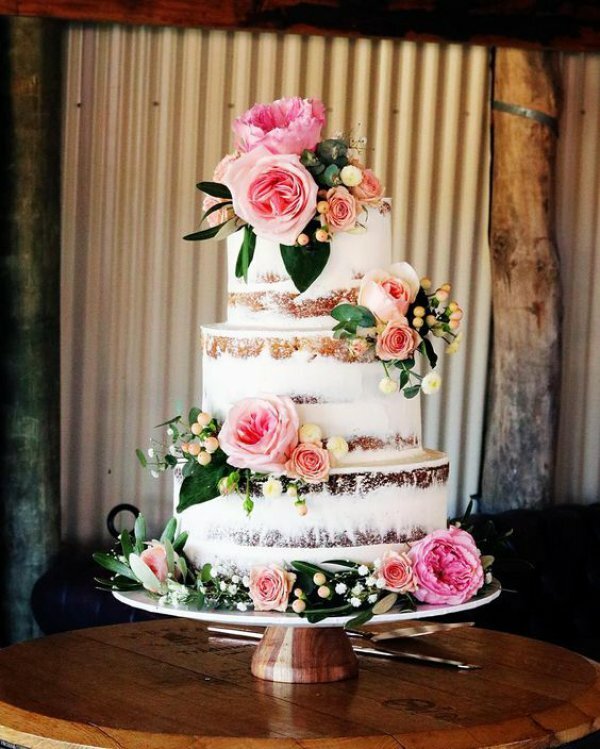 These semi-naked wedding cakes are meant to look stylish but rustic and the extra bit of icing makes each piece even more delicious! Semi-naked wedding cakes look divine decorated with fresh flowers on the side or you can pile them on top for a dramatic look. Which semi-naked wedding cake is your favourite? We want to know! We absolutely love all of these cakes! Which one inspires you for your wedding?